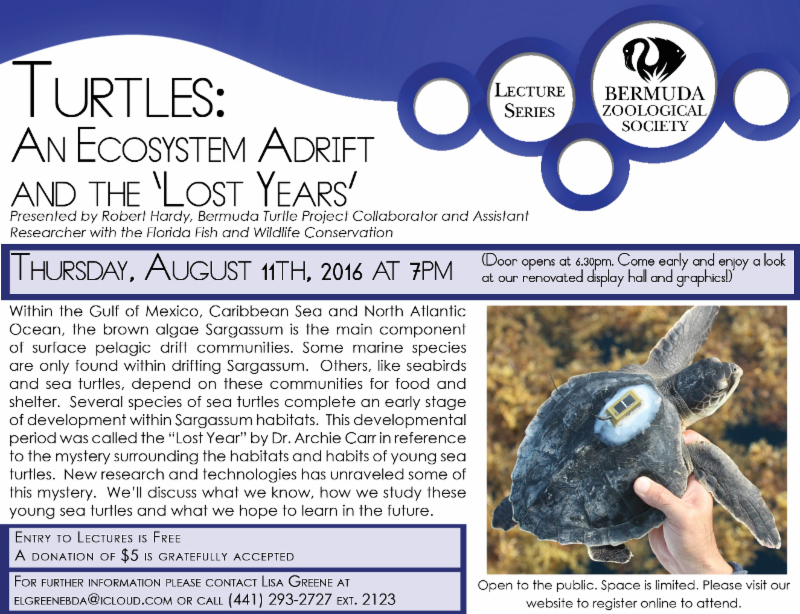 Presented by Robert Hardy, Bermuda Turtle Project Collaborator and Assistant Researcher with the Florida Fish and Wildlife Conservation, the Bermuda Zoological Society’s Lecture Series will feature a talk on “Turtles: An Ecosystem Adrift & The Lost Years” on Thursday, August 11. The event poster says, “Within the Gulf of Mexico, Caribbean Sea and North Atlantic Ocean, the brown algae Sargassum is the main component at surface pelagic drift communities. Some marine species are only found within drifting Sargassum. Others, like seabirds and sea turtles, depend on these communities for food and shelter. Several species of sea turtles complete an early stage of development within Sargassum habitats. For further information, contact Lisa Greene at elgreenebda@icloud.com or call 293-2727 [extension 2123].